Regardless of whether you prefer creamy or crunchy, eating peanut butter can support your weight loss efforts. This calorically dense spread may seem like a diet buster, but it has satiating qualities that may inhibit weight gain. You can even follow a "peanut butter" diet that promotes weight loss and better health, while still enjoying peanut butter every day. Of course, too much of any food will cause you to gain weight, so moderate your portion sizes. You'll be missing out on taste and satisfaction if you leave peanut butter out of your weight-loss plan, though. Consult a dietitian for help designing a weight-loss plan appropriate for you. Usually, weight loss requires you to exercise more and eat fewer calories. This creates a calorie deficit that forces your body to burn body weight for energy. In the process of eating less, higher calorie foods are usually avoided. Peanut butter, with almost 200 calories per 2-tablespoon serving and 16 grams of fat -- mostly unsaturated -- seems like it would fall into this category. Peanut butter is often paired with not-so-diet-friendly foods, such as white bread and jelly on a sandwich, or chocolate chips or butter in cookies. If you include peanut butter as part of a low-calorie plan and if you budget for the calories it provides, you can include it in a weight-loss diet. Peanut butter falls into the category of nutrient-dense foods -- meaning that it supplies a wealth of nutrients in all its calories. A paper published in Nutrients in 2010 noted that consumption of nuts -- including peanuts -- correlates with reduced incidences of coronary heart disease and gallstones -- as well as with reduced incidences of diabetes in women. Peanut butter is inherently good for you, and is good for a diet. Budgeting some calories for peanut butter is especially helpful when you've cut back on your calorie intake. Peanuts can help you stave off the hunger that's often associated with dieting. A review published in a 2008 issue of the Journal of Nutrition found that people experience little to no weight gain when they incorporate moderate servings of tree nuts and peanuts in their meal plans. When you add nuts to your diet, your appetite naturally diminishes and you compensate for the extra calories by eating less. A later study, presented in the 2010 issue of the British Journal of Nutrition, had more than 100 participants consume 56 grams of peanut products -- equal to about 3 tablespoons of peanut butter -- daily for four weeks. The researchers found that the addition of peanut butter to the participants' diets did not result in weight gain and helped improve their cholesterol levels. As long as you make the calories in peanut butter part of your low-calorie plan, it won't inherently cause weight gain. A 2013 study in Nutrition Research found that middle-school aged children, who reported regularly consuming peanuts -- including peanut butter -- were less likely to be overweight or obese than those who did not regularly consume peanuts or peanut butter. Children who eat peanut butter or peanuts, also report eating a higher quality diet and exhibited better lipid, or cholesterol, levels. No food magically causes you to lose weight, so don't start adding tablespoons of peanut butter to your current meal plan, and expect to drop pounds. If you don't change your other dietary habits by reducing your portion sizes and choosing lean proteins, whole grains and fresh vegetables, you might even gain pounds. Instead, use peanut butter as an alternative to foods that are less nutritious. The spread provides you with unsaturated fats, protein, magnesium, vitamin E and the B-vitamin, niacin. Just one-half of a serving listed on the jar -- 1 tablespoon at 100 calories -- counts as one ounce of protein, according to the Choose MyPlate website. Instead of butter, spread a tablespoon of peanut butter on whole-grain toast or stir a tablespoon of peanut butter into hot cereal instead of adding brown sugar. For a snack, spread peanut butter on celery sticks or on an apple, in lieu of having a processed cereal bar. Add a spoonful of peanut butter to a smoothie made with banana, milk and protein powder as a meal replacement. Instead of reaching for a cookie or a chocolate bar, enjoy a tablespoon of peanut butter. Choose the healthiest peanut butters by avoiding those that contain added sugar and hydrogenated oils. Choose peanut butters that only have peanuts listed on the list of ingredients. If you avoid brands whose labels state "with salt," you'll help keep your sodium intake in check. You might be trying to lose weight, but that doesn't mean you have to avoid all fat. Low-fat or reduced-fat peanut butters often taste inferior, and simply have more sugar or starch added to make up for the fat. Go for the real thing to get the full nutritional value, and peanut butter's satiating benefits. 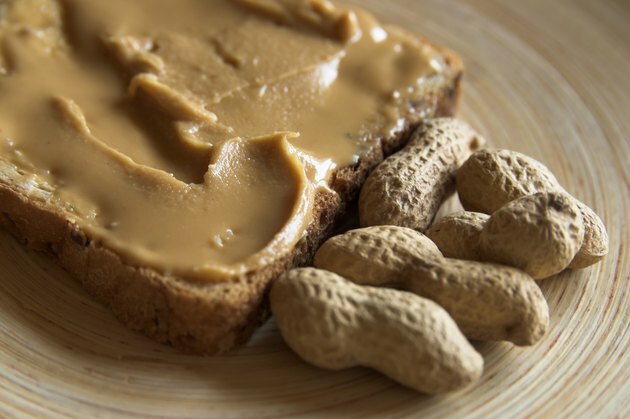 Choosing organic peanut butter is a personal choice, but more than 99 percent of peanut farms use fungicide to treat mold, which commonly occurs in peanuts. If avoiding these types of contaminants is important to you, organic is a better bet. Eating Well: Shop Smart: What Is in a Healthy Peanut Butter? Can You Lose Weight Eating Peanuts?